Tiësto OON (Dutch pronunciation: [ˈcɛstoː]; born Tijs Michiel Verwest on January 17, 1969) is a Dutch musician, DJ and record producer of electronic dance music. Although he has used many aliases in the past, he is best known for his work as DJ Tiësto. 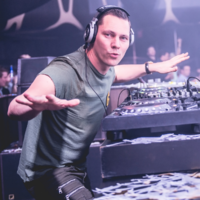 On his latest productions, however, he has dropped the "DJ" label and is now known simply as "Tiësto", an alias which is a twist of his childhood nickname. In 1997, he founded the label Black Hole Recordings with Arny Bink, where he released the Magik and In Search of Sunrise CD series. In 1999 and 2000 he collaborated with Ferry Corsten to create Gouryella. His 2000 remix of Delerium's "Silence" featuring Sarah McLachlan exposed him to more mainstream audiences. In 2001 he released his first solo album In My Memory which gave him several major hits that launched his career. He was named "World’s No.1 DJ" 3 consecutive times by DJ Magazine from 2002 through 2004. Just after releasing his second studio album Just Be in 2004 at the Summer Olympics, he performed live at the opening ceremony in Athens, Greece, becoming the first DJ to play live on stage at an Olympics. Tracks he made especially for the Olympics were mixed together and released as the mix compilation Parade of the Athletes later that year. In April 2007 Tiësto launched both his radio show Tiësto's Club Life on Radio 538 in the Netherlands and released his third studio album titled Elements of Life. The album reached number one on the Dutch album chart as well on "Billboard Top Electronic Albums" in the U.S. and received a nomination for a Grammy Award in 2008. Tiësto released his fourth studio album called Kaleidoscope in October 2009.